I can't believe we are on to November already. Hopefully pumpkin is a fall thing and not just an October thing, because I am not quite over it yet. When I found this recipe last year from The Girl Who Ate Everything I immediately knew I had to make them. And I did just that. Many times over. They were cakey, delicious, and super moist. 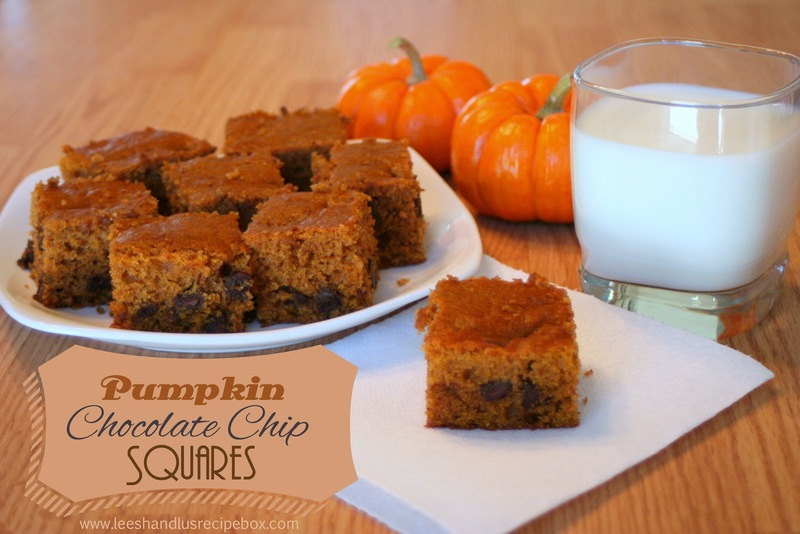 Plus these are so much easier than spooning out and baking pumpkin chocolate chip cookies. I adapted the recipe slightly to use oil instead of butter and subbed half of the butter for applesauce. That way I can eat them for breakfast and not feel too bad about it. Preheat oven to 350 degrees and line the bottom and sides of a 9-by-13-inch baking pan with foil, leaving an overhang on all sides. Lightly spray grease the foil. In a medium bowl, whisk together flour, pie spice, baking soda, and salt; set aside. In a large bowl, mix the oil, applesauce, sugar, and pumpkin puree on medium-high speed until smooth with a mixer; beat in egg and vanilla until combined. Reduce speed to low, and mix in dry ingredients until just combined. Fold in chocolate chips. Lift cake from pan, peel off foil, and use a serrated knife to cut into 24 squares. I usually use half all-purpose flour and half whole-wheat with great results. I like these best served chilled, so I usually refrigerate them after they are fully cooled. *For the pumpkin pie spice, triple this: 1/2 teaspoon cinnamon, 1/4 teaspoon ginger, 1/8 teaspoon nutmeg and 1/8 teaspoon cloves.